Dirty Girl Farm is a line of all-natural skincare products and holistic apothecary based in Michigan. All items are free from chemicals, toxins and gluten. Products are never tested on animals. We strive to make products vegan whenever possible. Established in 1994, Dirty Girl Farm creates products with natural ingredients straight from the earth. We believe in healthy skin and happy souls. 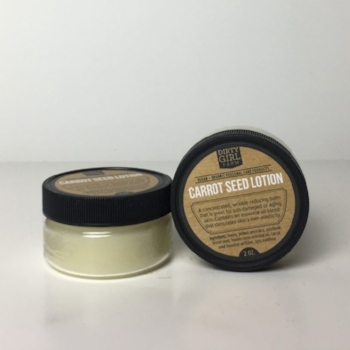 Carrot Seed Lotion is a concentrated wrinkle-reducing lotion, great for sun-damaged or aging skin. Contains essential oil blend that stimulates skin’s own elasticity. Ingredients: Honey, Prunus ameniaca (Apricot Kernal Oil), patchouli, fennel seed, frankincense essential oil, carrot seed essential oil blend, Apis mellifera (beeswax). Because our Activated Charcoal Scrub uses sugar as its exfoliating property, it’s more gentle than a salt-based scrub. This is a great option for dull skin if you are looking to exfoliate but have delicate skin. Ingredients: Activated charcoal, kaolin clay, sugar, patchouli essential oil and lavender essential oil. Rosewater Compound revitalizes aging skin, helps keep fine lines and wrinkles away and fights acne, dermatitis and eczema. Ingredients: Rose Flower Water, Organic Coconut Oil, Organic Jojoba Seed Oil, Emulsifying Wax, Palmitic Acid, Stearic Acid, Myristic Acid, Glycerin, Witch Hazel Water, Vitamin E, Soybean Oil, Phenoxyethanol, Organic Neem Seed Oil, Organic Rosemary Leaf Extract, Organic Sunflower Seed Oil, Organic White Willow Bark Extract, Organic Alcohol, Alcohol, Xanthan Gum, Tetrasodium EDTA. Infused with tea tree, Breakout Buster Facial Soap acts as a balancer to prevent acne breakouts and oily patches while healing and moisturizing dry-flaky patches. Great for acne-prone and combination skin! Ingredients: plant sourced- Sodium Cocoate, cocamidopropyl betaine, Sodium Stearate, Glycerin, Water, Sorbitol, tea tree essential oil, red thyme leaf essential oil and thyme leaf. Wild Violet Eye Cream fights puffiness, nourishes the skin, plumps wrinkles AND smells heavenly. We recommend adding your favorite Dirty Girl Farm facial cleanser, toner, serum and moisturizer. Don’t forget to do your weekly at home facial by adding a scrub and mask. Ingredients: Equisetum spp. (horsetail), Viola odorata (organic wild violet leaves and flowers), Prunus amygdales (sweet almond oil), Apis mellifera (beeswax). Zits don’t stand a chance against the detoxifying power of tea tree, willowbark and green clay! This potent herbal Zit B Gone Stick removes oil, unclogs pores, draws impurities to the surface dries oil and shrinks pores. We recommend adding your favorite Dirty Girl Farm facial cleanser, toner, serum, eye cream and moisturizer. Don’t forget to do your weekly at home facial by adding a scrub and mask. Ingredients: jojoba oil infused with calendula, yarrow, parsley, willowbark and echinacea, essential oils of: lemon, fennel, tea tree, juniper and eucalyptus, french green clay and beeswax. We'll be adding to our line, let us know in the comments what type of products you'd like to see in the salon.